Hi everyone! This is a busy week here on Sprinkled With Glitter. I have THREE new videos planned for you this week. And I’m starting out with a bang! I am guest designing for Concord & 9th this month. They have some fabulous new products that they’ve released this month and I’m thrilled to create with them. I’ve created a couple o card projects using the products today and I can’t wait to share them with you. I’ll be using the Wonderful Women stamp set, along with the Wonderful Words dies to create these cards. This stamp set and die set work so beautifully together, but can also be used on their own. I love that Concord & 9th has designed these products so well. Now you know I can’t resist making fabulous word dies like these sparkle and shine in one way or another. I am using one of the newest colors of the ThermoWeb Deco Foil to make these die cut sentiments really shine. I love the soft gold color of the champagne foil. I applied the foil to the die cut words using a little Zig Two Way Glue. This is one of the easiest ways to use foil. No special machinery required. You just apply the glue, let it dry and then press the foil on. I usually run in through my die cut machine to give it a really good press, but that’s probably not necessary. This actually gives a little more texture to the foil too, which I like. If you want an ultra smooth look, try the ThermoWeb toner sheets instead. I also cut these words out of fun foam that has been adhered to some white card stock. I prefer to adhere my fun foam to white cardstock before die cutting because it prevents the fun foam from stretching out. And the fun foam is the perfect way to add lots of dimension and stability to these intricate words. I sandwiched the vellum sentiments between two layers of the fun foam. This gives a little lift to the vellum and allows it to float off of the card front. I love to add lift to vellum because I think it draws attention to its beauty. For the Wonderful Mother card, I decided to keep the whole card very soft. I cut the Bouquet Die from Concord & 9thfrom some vellum. I’m only using the top portion of this die cut on my card. I tucked it behind the die cut and stamped sentiment and adhered it to a white card front. It almost looks like this was the way the die cut was originally designed. And the softness of the vellum makes this card so very sweet. I added more champagne foil to the edge of the card front, using the same method as before and gave the card a pop of color with some textured pool card stock. I finished it off by adding just a touch of sparkle with some Sparkling Clear sequins from Pretty Pink Posh. I must admit, I was fighting this card at first, but I love the result. This would make a gorgeous wedding card as well. I wanted the second card to still feel feminine, but not nearly as soft. I layered the sentiment over some various patterned papers from the Simple Stories I Am 6x6 paper collection. The bold black and white stripe (so very Kate Spade) combined with the soft vellum makes for an absolutely “lovely” combination. I also added a touch of sparkle to the top of the heart using the 3mm Sequin Strands from Concord & 9th. It’s a fun way to add sparkle to your cards. I just took a little bit of it and attached it to the top of my die cut heart using my Tiny Attacher. It’s a fun and unexpected way to use this fun embellishment. It would also be fun to add this to the edge of a card, or attach it to a gift! 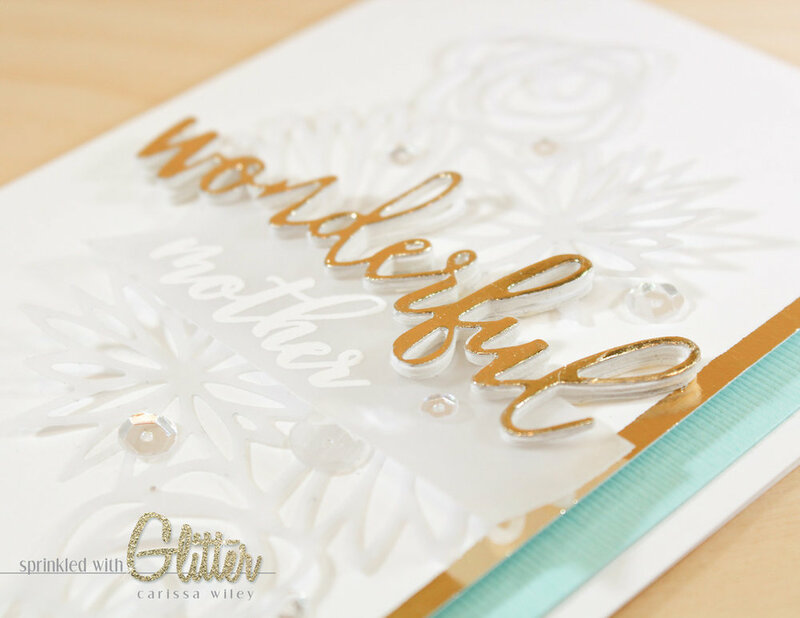 I’ve included a video tutorial walking you through these two card projects. Be sure to check it out. I’d love for you to subscribe while you’re there and give the video a thumbs up! I’ve also linked the products used in these projects below. I’ve linked multiple sources for these products for your convenience. Even though these cards use a very similar sentiment, they each have their own personality and feel. I think it really shows the versatility of these stamps and dies. Thanks for stopping by today. I hope you’ve enjoyed these projects. Until next time (Wednesday), I hope you have a fabulous day!